I just realized that it has been a year since we've made any progress in the kitchen. A year, people. Time flies by and there are so many projects to tackle that the kitchen just hasn't progressed. But that's all about to change. We are dedicating all of our spare time during the entire month of October to the kitchen. It's about to get real. I am still going for something along these lines. And I am still having a difficult time deciding on a cabinet color. 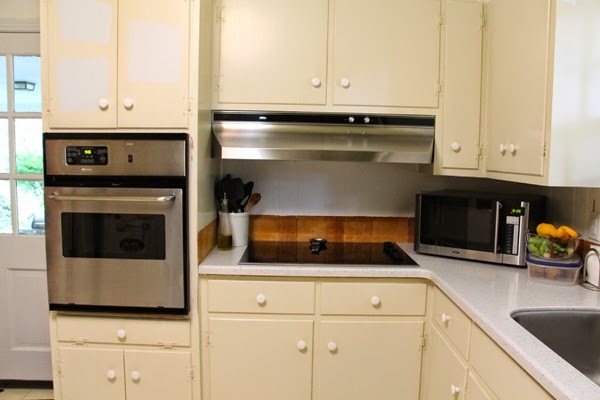 I will say that some, if not all, of the cabinets will be white. That is all I know for sure. The feather imprint knob from Anthropologie (#4 above) is no longer an option for two reasons. First, it is no longer available. More importantly, it's too large. Also, the amazing wood table from CB2 has been gone from their website for awhile. Sad. I'm trying to convince Seth that we should just build our own. I like this one. And I think it's a doable DIY. What we have done in the last few months is purchase a new wall oven. When you have a tiny space for your wall oven and can only fit a 24-incher, you have few options. 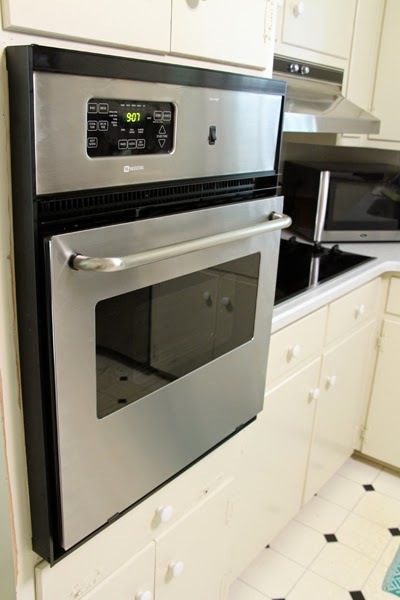 When you are on a budget but really want stainless steel to match your other appliances, you have even fewer options. So, needless to say, this wall oven was my first choice for our specific situation. 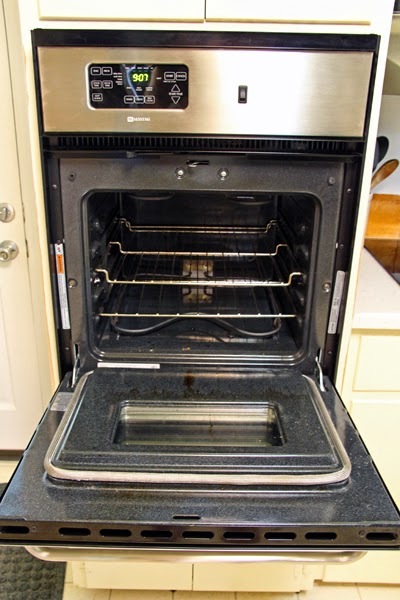 It is not my dream oven. If we had an endless supply of money, I would have chosen this for our space. But saving around $800 was more important to us. And, as I've mentioned before, we don't see this as our forever home so we are trying to make wise choices. On to the positives. 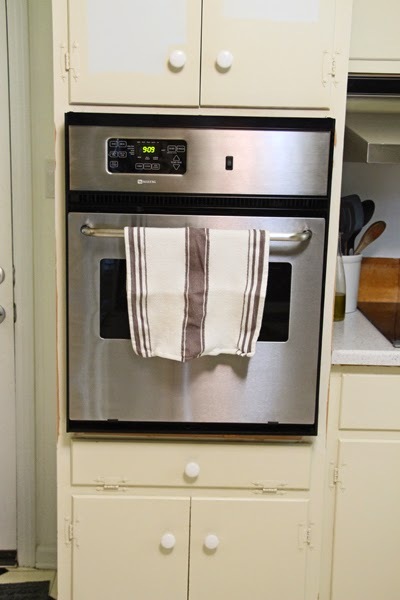 It plays nicely with our other stainless steel appliances. It bakes evenly! It is slightly roomier inside (our old wall oven had thicker walls that ate into the inside square footage). It has a working clock. And timer. And OVEN LIGHT! I feel so spoiled. I will give you one fair warning if you're oven shopping. This model has a fan (that I believe mostly helps it cool down, but that another reviewer mentioned helps circulate hot air for even cooking) that makes a fair amount of noise while running. It isn't "loud" per se, but it isn't quiet. It doesn't really bother me but there are enough people who mention it in their reviews that I thought I'd disclose that info here as well. 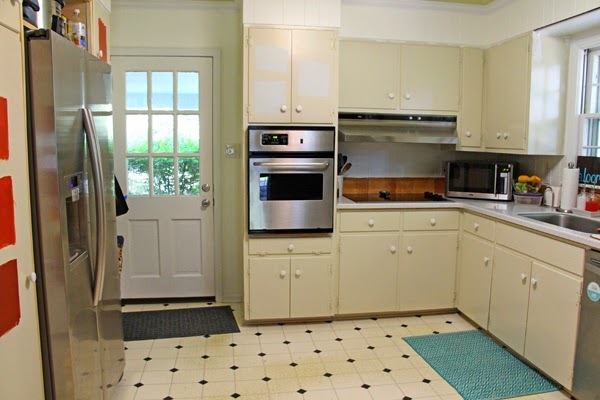 Just squint your eyes and imagine clean, white cabinets with brushed nickel pulls, a subway tile backsplash, and a gray tiled floor. And maybe a pop of color on our carport door. Soon. Very soon. I can see it now! :-) can't wait for our next visit!